I found this recipe in some magazine, possibly Rachael Ray. I don’t know. 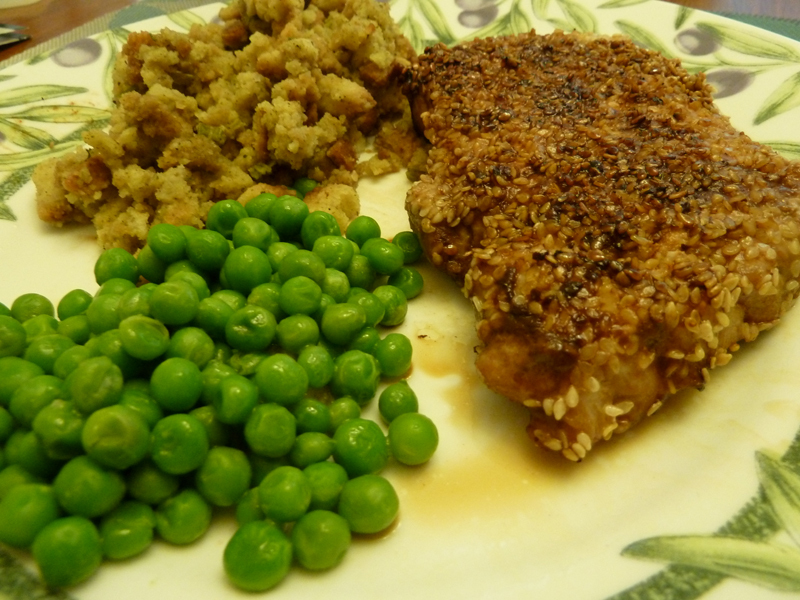 It’s very simple and produced a unique flavor of pork chop that wasn’t so bland. I found that after the initial searing, it helped to cover the chops with a lid to keep them from drying out; it worked very well. It was the first time I bought and used rice vinegar. Enjoy! In a resealable bag, mix soy sauce, sugar, and vinegar. Add pork, marinate 20 minutes. In skillet, heat 1 tbsp. oil over medium high heat. Press seeds into pork on both sides. 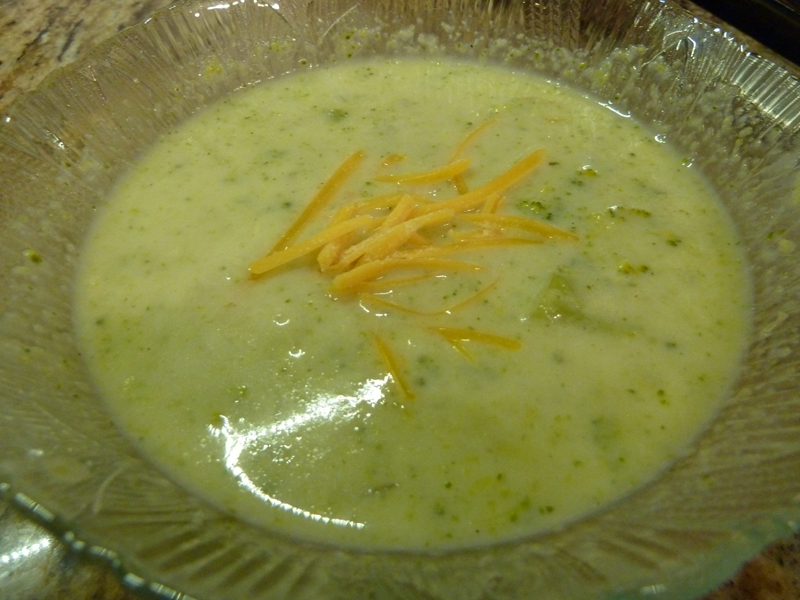 I have always wanted to make cream of broccoli soup and this was a great first try. It was a little on the watery side, so if you prefer it thicker, you could just add less milk or add another thickener, in addition to the flour, like cornstarch, etc. I used butter and reduced the amount to 1.5 TBSP. I used a quarter onion and added 2 celery stalks and it was more than enough. This was the first time I cooked with raw onion in about a year and a half. I learned that I can eat cooked onion, but being around raw onion cooking still makes me feel off and sick. So now I know! Next time I will use onion powder and add more celery. Very tasty, healthy, and full of nutrients! Enjoy…. In a medium-sized cooking pot, add water and broccoli florets and bring to boil; reduce heat and cook for about 3 minutes. Drain, reserving all of the water. In a food processor or blender, process half the cooked broccoli until fairly smooth. Chop remaining broccoli and set aside. In a heavy-bottomed cooking pot, melt butter or margarine, add onion and celery and cook for about 3 to 4 minutes until soft. Stir in flour; cook, stirring constantly for about 1 to 2 minutes. Add reserved water and chicken bouillon granules, and bring to boil, stirring constantly. Reduce heat to medium; simmer, stirring constantly until thickened. Stir in milk, nutmeg, pepper, and processed and chopped broccoli, and heat through. Adjust seasonings to taste. Serve garnished with grated cheddar cheese. This is a very tasty recipe for baked rosemary potatoes. 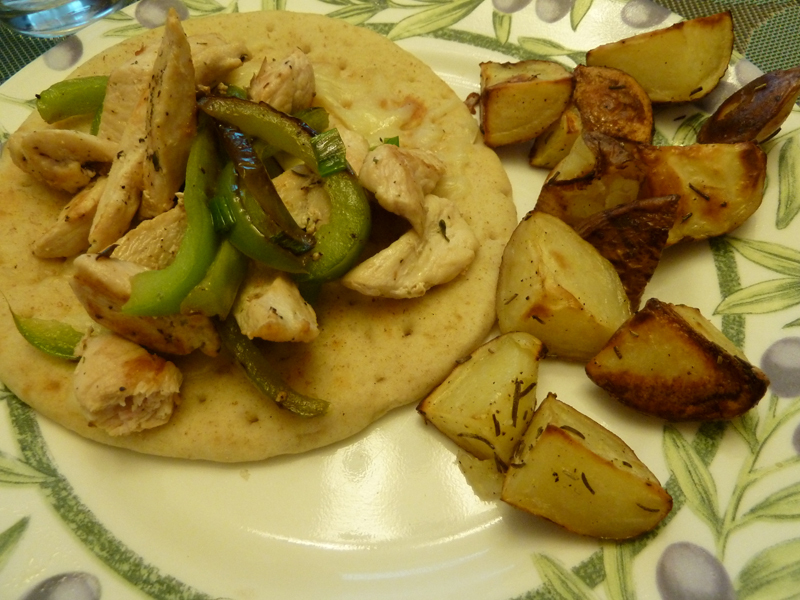 My husband and I loved this recipe and will make it again. It’s from the cookbook “Cook This! Not That!”. Fresh rosemary is best here. Makes 4 servings. Toss the potatoes with the oil, rosemary, and a generous amount of salt and pepper. Roast until brown and crispy on the outside and tender inside, about 30 minutes. 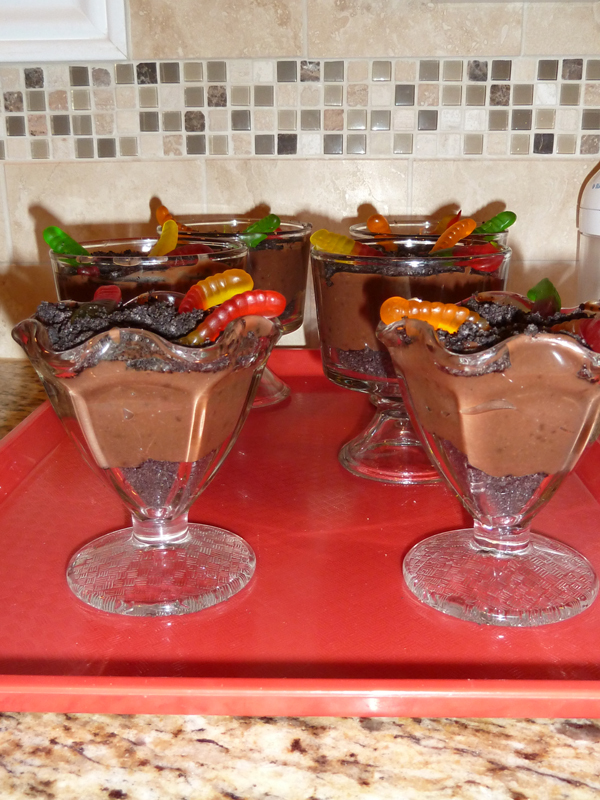 These pudding cups take a simple treat to such a fun level – even us adults had fun making and eating them! What is great, from an adult perspective, is that the Oreo topping prevents that yucky pudding ‘skin’ from forming on the top once refrigerated,. I do suggest putting plastic wrap on top while refrigerating anyway. IT’S A SUPER CUTE recipe! We ended up making a larger box of instant pudding as it was on sale and used extra Oreo crumbs; this recipe is not exact. We made 6 servings. Place the chocolate sandwich cookies into a resealable plastic zipper bag, and crush with a rolling pin into crumbs. For a more mudlike appearance, untwist the cookies and scrape off the creme filling before crushing cookies. Sprinkle about 1/3 of the crushed sandwich cookie crumbs into the bottom of a serving bowl, and spoon the chocolate pudding over the crumbs. Smooth out the top of the pudding, then top with the rest of the chocolate cookie crumbs to resemble dirt. 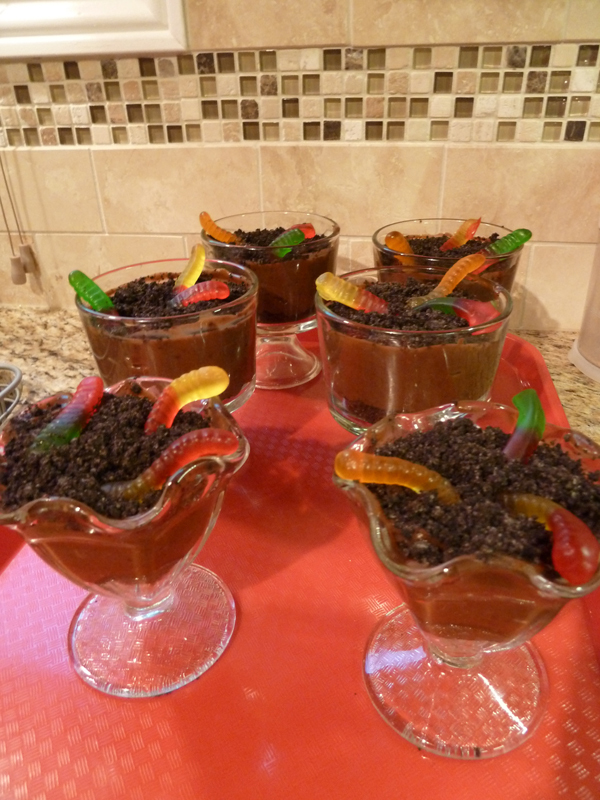 Poke gummy worms halfway into the dirt. Refrigerate until serving.